Quantum Lite Handheld Audio IP Codec & Studio Base Station. Overview. Quantum Lite is Prodys’ new handheld audio codec for professionals having no equal in the broadcast market. This device enables extremely reliable field audio contributions over wireless networks by means of concurrent use of two UMTS /LTE network connections. No risk when double SIM operation is enabled. No risk as there is with incoming GSM calls disturbing your smartphone codec app. No risk as a large battery capacity is provided. No risk as professional XLR cabled microphones can be used directly. No risk as input/output level & cue balance controls are high quality professional pots & knobs. 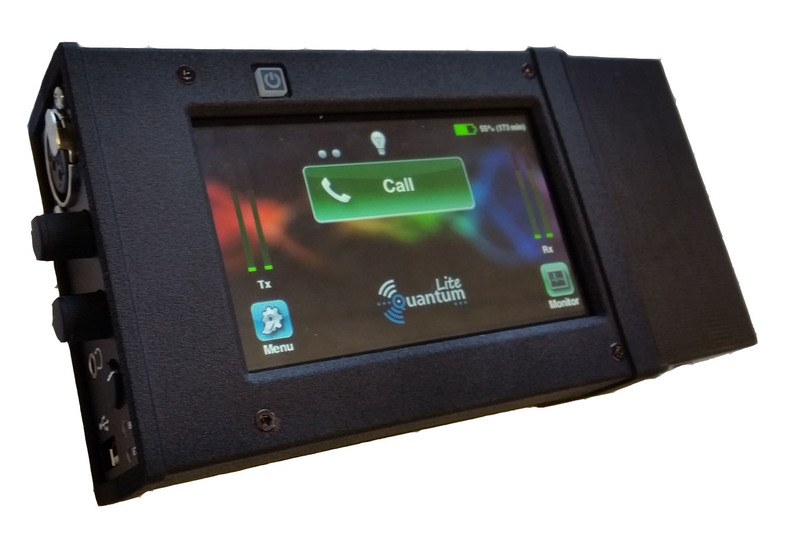 Quantum Lite can combine up to 4 up-link IP connections: 2x UMTS/LTE, 1x Ethernet & 1x Wifi (optionally) for any scenario. This device also turns “off-line” jobs into easy tasks with its embedded audio recording and transfer. The Quantum Lite is exactly right for reporting journalists who take the task to hand seriously. Low delay audio encoding with Opus & Aptx. Inherits world-class IP technology from the Prodys Audio/Video codec family (BRAVE protocol) with full error correction method and bonding. Audio recording on SD memory, playback and file transfer. Weight with battery : 580 g.
Quantum Lite Base Station. Specification. 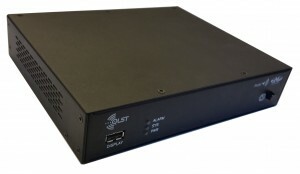 QLST is the ideal studio mate for the handheld Quantum Lite product. Alternatively any base station member of the Quantum family can inter operate with Quantum Lite. 1/2 19” x 1RU (210 x 42 x 173mm, W x H x D). VDC input 90V to 264V – Connector plug Ø5.5 x Ø2.5 x 11mm. 1x control Ethernet (LAN1, 10/100BaseTx Ethernet, RJ45 connectors). 1x streaming Ethernet (LAN2, 10/100BaseTx Ethernet, RJ45 connectors). 2x USB for external memory (file transfer reception). LED status indication for mayor alarm, minor alarm and power-on. Optional removable touch panel control. Quantum Lite & QLST Base Station, Images.